Today, U.S. rice farmers produce more rice using less land, energy and water than they did 30 years ago. Each year, over 9 billion kilograms (20 billion pounds) of rice is grown and harvested by local farmers in the states of Arkansas, California, Louisiana, Mississippi, Missouri, and Texas. 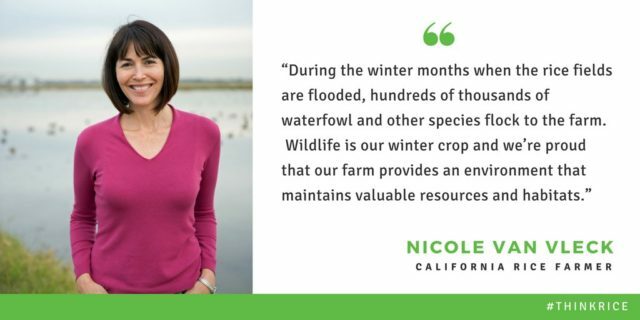 These farms provide economic opportunity and growth for their community, critical habitat for migratory birds, and the promise of a thriving and sustainable crop for generations to come. The water needed to produce 45 kilograms (100 pounds) of rice has decreased by 33% over the past three decades. This is in part because of many advancements in growing practices including precision land leveling and more efficient watering practices. In addition to water savings, the adoption of no-till and reduced tillage practices helped U.S. rice farmers decreased soil loss by 72% over the past 30 years. U.S. rice farmers are committed to being good stewards of the resources they have by improving their efficiencies each year, all while providing critical habitat for migrating waterfowl. U.S. Rice farmers provide 35% of the food resources needed each year for migrating waterfowl in critical flyways in the U.S. If these rice fields weren’t flooded over the winter months, it would cost more than €3 billion ($3.5 billion USD) to replace the food and habitat provided with managed wetlands. Over the past five years, USA Rice partnered with Ducks Unlimited, a U.S. waterfowl conservation and sportsmanship group, to help educate and provide resources for rice farmers to adopt conservation practices. The financial assistance provide by the program will positively impact over 1,000 farms and over 311, 600 hectares (770,000 acres) by 2023. Today, U.S. rice farmers can produce the same amount of rice produced in 1987 on 331,800 fewer hectares (820,000 fewer acres), and that number is improving every year. Advances in farming practices and innovation help farmers grow more food using less water and fewer acres of land. 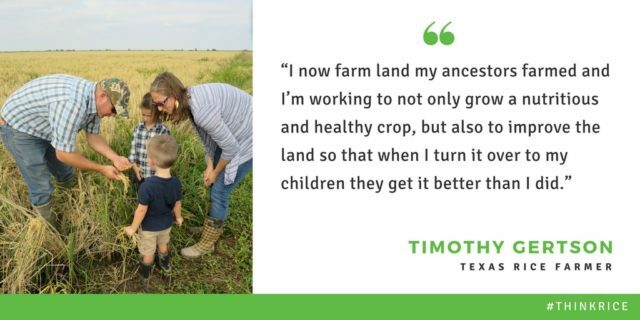 The U.S. rice industry not only provides jobs in rural areas throughout the U.S. but also cultivates its role as good stewards of the land to ensure that it is viable for future generations to produce food and fiber. Each U.S. rice farm contributes about €863,000 ($1 million U.S. dollars USD) to their local economy and about 6 jobs per farm with workers earning an average of €63,000 ($73,000 USD) per year. Overall rice farmers in the U.S. provide 31,710 jobs totaling €1.9 billion ($2.3 billion USD) in total annual salaries. Rice provides an economical source of carbohydrates and key nutrients for families across the globe. Rice includes more than 15 vitamins and minerals, and beneficial antioxidants while reducing the risk of heart disease, diabetes and certain cancers. U.S. rice farmers share the bounty of the harvest with their communities through donations to local food banks as well as programs to provide rice for school lunch programs. In partnership with USDA, U.S. rice farmers also contribute 100,000 metric tons of rice for international food aid each year. America’s rice farmers produce more than 9 billion kilograms (20 billion pounds) of rice each year, on an average of 1.1 million hectares (2.7 million acres) of land. 85% of the rice that is consumed in the United States is grown by U.S. rice farmers. 50% of rice produced in the U.S. is exported to more than 110 countries. Field to Market. Environmental and Socioeconomic Indicators for Measuring Outcomes of On-Farm Agricultural Production in the United States. December 2015. Economic Contributions of the U.S. Rice Industry to the U.S. Economy. Agricultural and Food Policy Center, Texas A&M University. February 2017. In order to provide credible, third-party verification of sustainability to customers, all major Alaska fisheries are certified sustainable by the Alaska Responsible Fisheries Management Certification.